restaurants: rm seafood | eat. drink. fly. 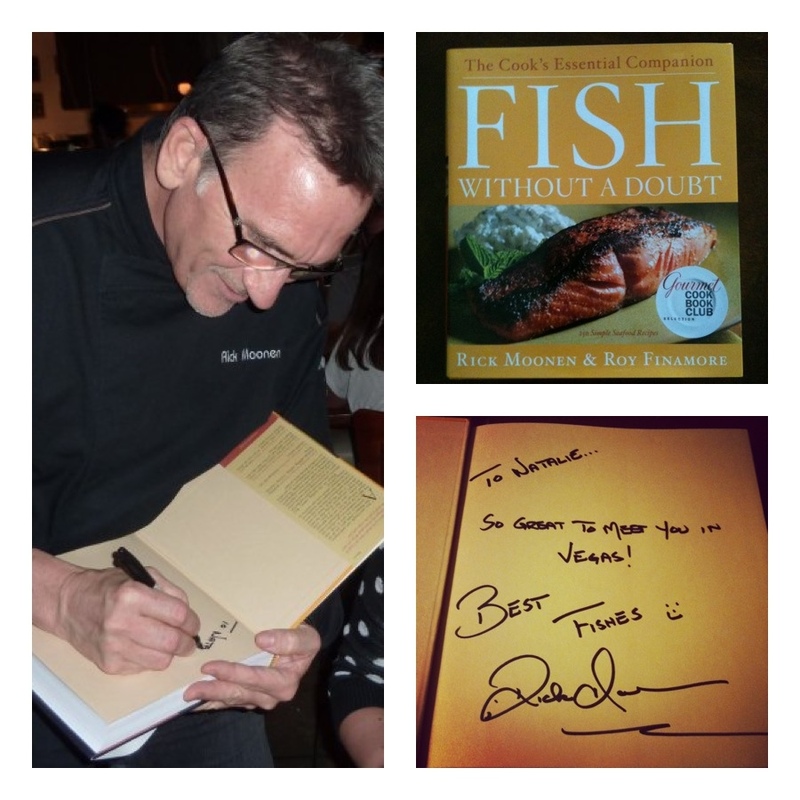 rick moonen’s rm seafood is a pretty choice little place tucked in to the corner of mandalay bay right by the house of blues. 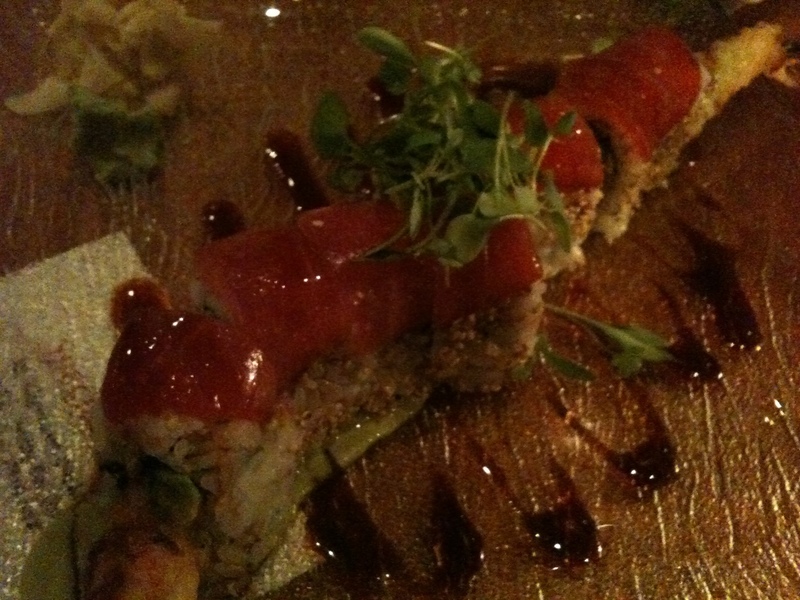 it has an upstairs fine dinning restaurant and a downstairs casual restaurant with a raw bar. i’m a huge supporter of this concept… because sometimes you want to go all fancy pants and sometimes its nice to have a bit more of a casual option for your food. we ate at the downstairs for this occasion, since we had just done a fancy pants meal the night before. and let me assure you that downstairs did not mean there was any sacrifice in quality or service. the big underlying focus of rick’s restaurant is sustainability and i can totally appreciate that. in a city like las vegas, that is so utterly unsustainable, the irony is delicious. of course, i started with a cocktail. 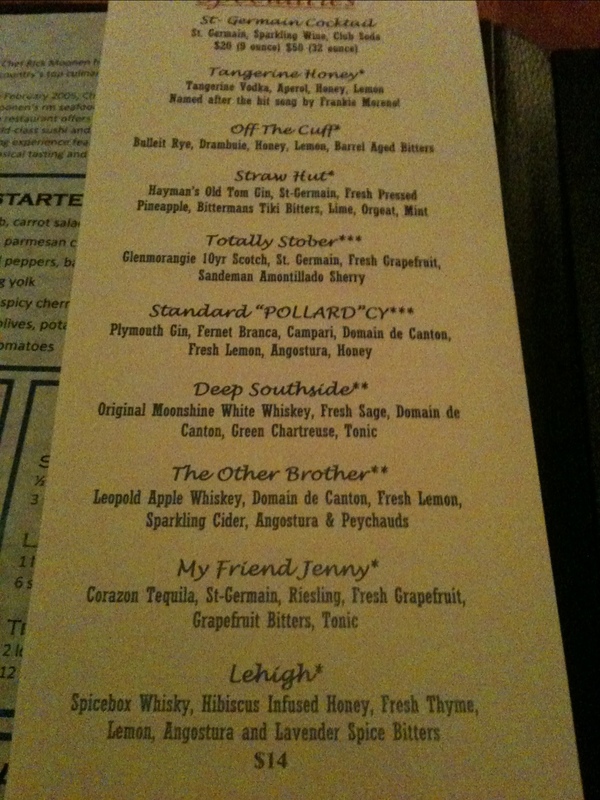 the menu was mighty and enticing, but i settled on the lehigh. 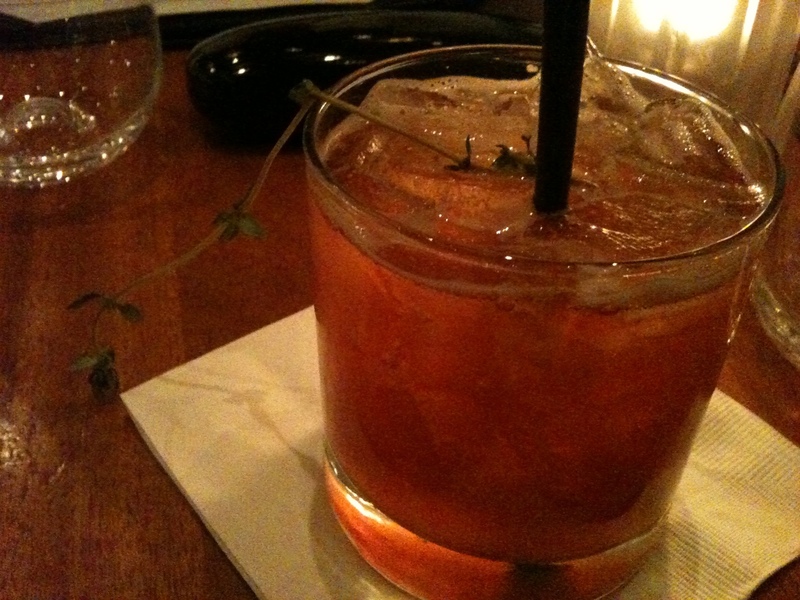 and a yummy little drink it was. i only had the one cocktail, as we ordered a bottle of wine – the kim crawford white for the record. and then, on to the food. i really wanted to try something from the raw bar, but my mom isn’t a big sushi/raw fish fan. we agreed on the ebi-go roll which has tempura prawns in it and just the tuna sashimi on the top like a lovely little blanket of yum. it also had a little jalapeno in it, which added a nice spiciness without drastically changing the flavour as wasabi would. like an idiot, i dipped my first piece in soy sauce out of habit, but after that, i just ate it as is. the flavours were so delicate and balanced, it didn’t need anything else. 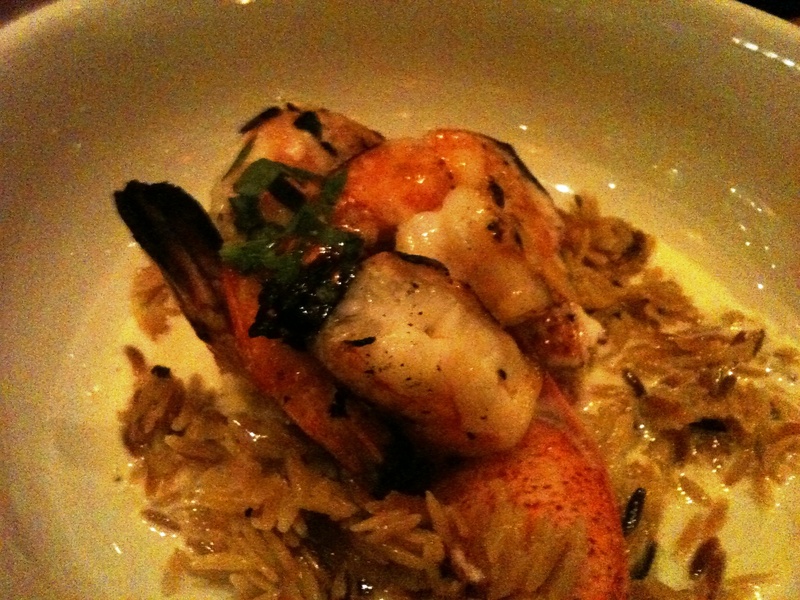 for our mains, my mom had the chef’s daily special, the surf & surf, which was lobster and prawns on toasted orzo. and man oh man was it ever good. 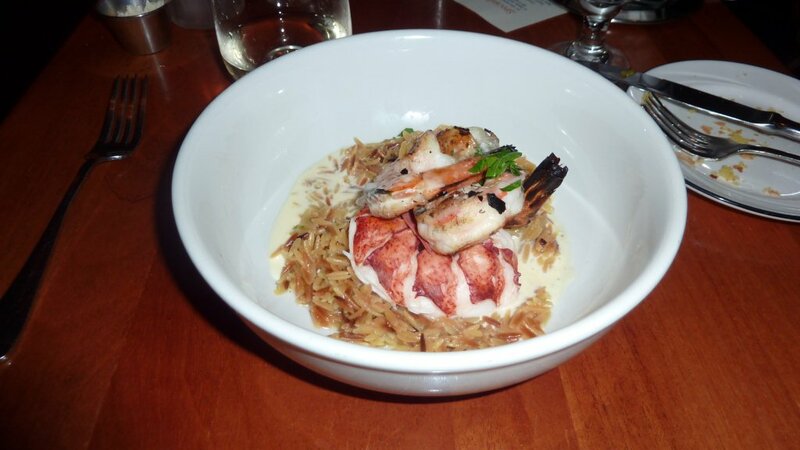 the lobster was buttery and perfectly cooked – admit it, how many times have you had an overcooked rubbery lobster? it’s so disappointing. and the toasted orzo was nutty and full of flavour. i wish i could remember the sauce with it. 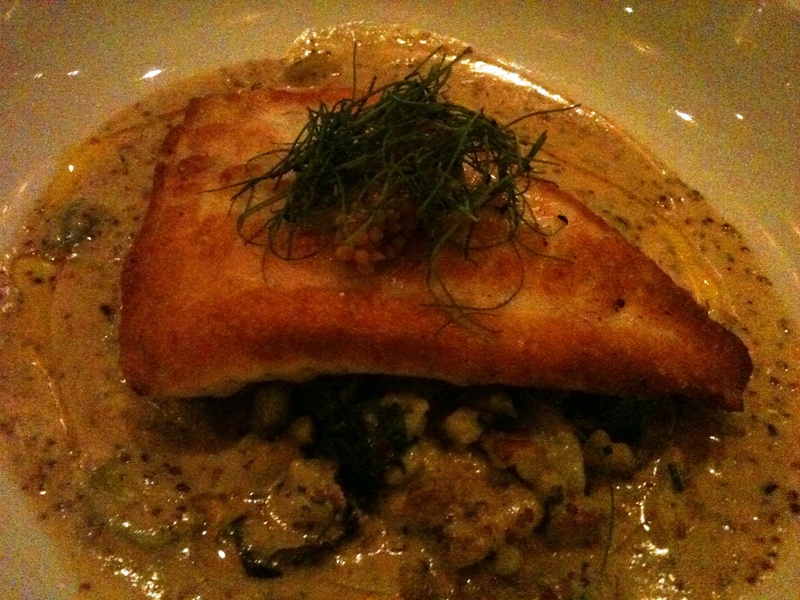 i ordered off the menu, the turbot caught my eye right away. the waiter chris (hi chris! – he asked for my blog address) declared it to be a favourite and really, it had me at dijon-chive spaetzle. also i LOVE ramps. the turbot was cooked beautifully with a golden crust so crisp that you could knock on it, but the underside of the fish was perfectly done. the spaetzle was tender and not gooey and the mustard sauce was a bit strong on the first few bites, but once your palate got used to it, it was really lovely. for dessert, it was a simple choice. 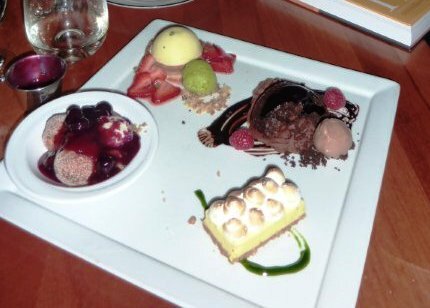 the dessert sampler. because if you can try more than 1 dessert at a time, you sure as hell should. ya, i’m not even sure what to say about this. it was just ridiculous. and the key lime pie was my other favourite – to no one’s surprise. the cilantro syrup seemed like an odd choice for a split second until it hit me, that OF COURSE! cilantro and limes are perfect partners in all sorts of savoury mexican applications, why wouldn’t they be BFF on the dessert plate? 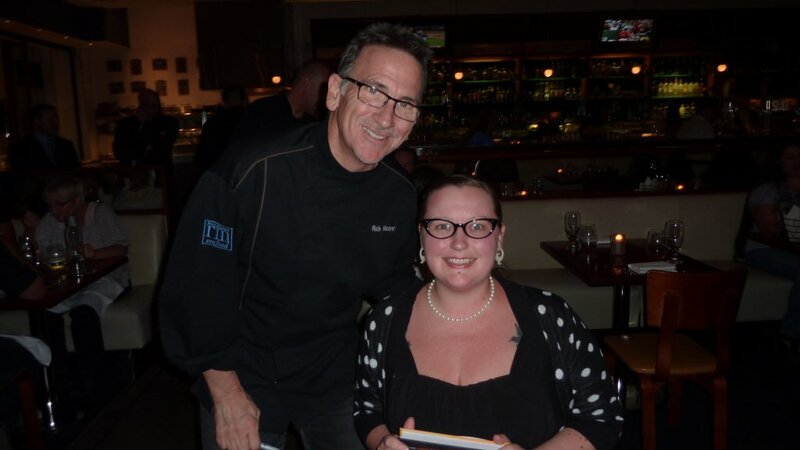 and then… as if this meal wasn’t already all kinds of awesome, i actually got to meet rick moonen himself! its an absolutely wonderful thing to be able to tell the chef face to face how much you enjoyed not only the meal, but the whole inspiration for the restaurant. and he was so nice. like, legitimately kind and interested in my comments and discussing restaurants in vegas and vancouver that focused on sustainability. it was a real pleasure to have met him, and big thanks goes out to our wonderful server chris that got him to come out for me. i also took home his book which is an insanely huge collection of all sorts of knowledge on how to cook, handle, clean and select fish. it’s a very exciting read thus far, i’m glad i picked it up. WHY are you not writing restaurant reviews for a major publication, as a career? I mean, reading this on par or better than some of the best food columns I’ve read (that makes me sounds like a foodie, I am not, but I do love reading reviews). Best fishes … so good.